At least 20 boats carrying thousands of migrants on their way to Italy were spotted on Friday off the coast of the western city of Sabratha, the Libyan navy said. 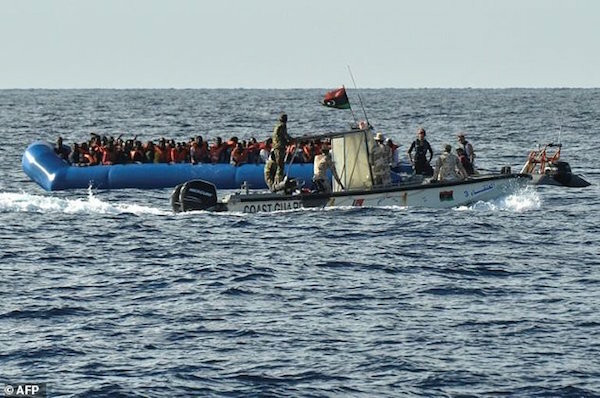 “Large rescue and interception operations are under way” with the help of the Libyan coastguard, fishing and commercial boats and in coordination with the Italian authorities, navy spokesman General Ayoub Qassem said. “Today is the day of a massive exodus of illegal migrants toward Europe,” he added, without elaborating. The North African country has long been a stepping stone for migrants seeking a better life in Europe. Smugglers have stepped up their lucrative business in the chaos which has engulfed Libya since its 2011 revolution. Libya has urged Europe, and particularly Italy, to supply its coastguard with the equipment it says it needs to monitor its southern borders, through which migrants, mostly from sub-Saharan African, enter the country. More than 50,000 migrants have landed on Italian coasts since the beginning of this year, not counting those rescued in recent days, while more than 1,400 have drowned or are missing, according to the United Nations. Of the 181,000 migrants who entered Italy last year, some 90 percent arrived via Libya.